Let’s imagine you have a small project, where you used to deliver new features in just 2 days. Then your project grows bigger. The delivery date becomes uncontrollable, from 2 days to 1 week, then 2 weeks. It drives you crazy! You keep complaining: a good product shouldn’t be so complicated! That’s exactly what I have faced and it was really a bad time for me. Now, after working for a few years in this area, cooperating with many excellent engineers, I realized that the product design doesn’t really make the code so complex. It’s me who makes it so complicated. We could have the experience writing spaghetti code which significantly hurts the performance of our projects.The question is how can we fix it? A good architecture pattern might help. In this article, we are going to talk about one of the good architecture: Model-View-ViewModel (MVVM). MVVM is a trending iOS architecture that focuses on the separation of development of user interface from development of the business logic. All of those architectures have the pros and the cons, but they are all designed to make the code simpler and clearer. So we decided to focus on why we select MVVM over MVC and how we move from MVC to MVVM. If you are interested in the cons of MVVM, please refer to the discussion at the end of this article. The ViewController contains the View and owns the Model. The problem is we used to write the controller code as well as the view code in the ViewController. It makes the ViewController too complex. That’s why we called it a Massive View Controller. While writing a test for the ViewController, you need to mock the view and the life cycle of it. But views are difficult to be mocked. And we actually don’t want to mock the view if we only want to test the controller logic. All these things make writing tests so complicated. So the MVVM is here to rescue. According to the definition, the View consists of only visual elements. In the View, we only do things like layout, animation, initializing UI components, etc. There’s a special layer between the View and the Model called the ViewModel. The ViewModel is a canonical representation of the View. That is, the ViewModel provides a set of interfaces, each of which represents a UI component in the View. We use a technique called “binding” to connect UI components to ViewModel interfaces. So, in MVVM, we don’t touch the View directly, we deal with business logic in the ViewModel and thus the View changes itself accordingly. We write presentational things such as converting Date to String in the ViewModel instead of the View. Therefore, it becomes possible to write a simpler test for the presentational logic without knowing the implementation of the View. Let’s go back and take a higher look at the figure above. In general, the ViewModel receives the user interaction from the View, fetches data from the Model, then process the data to a set of ready-to-display properties. The View updates itself after observing the change of the ViewModel. That’s the whole story of the MVVM. Bind UI components with the ViewModel. Write controller logics such as pagination, error handling, etc. Write presentational logic, provide interfaces to the View. You might notice that the ViewModel is kinda complex. In the end of this article, we will discuss the bad part of the MVVM. Anyway, for a medium sized project, the MVVM is still a good choice to eat an elephant one bite at a time! The app fetches popular photos from 500px API and lists photos in a UITableView. Each cell in the table view shows a title, a description and the created date of a photo. Users are not allowed to click photos which are not labeled for_sale. In the func tableView(_ tableView: UITableView, cellForRowAt indexPath: IndexPath) -> UITableViewCell, we select the corresponding Photo object and assign the title, description, and the date to a cell. Since the Photo.date is a Date object, we have to convert it to a String using a DateFormatter. We select the corresponding Photo object in func tableView(_ tableView: UITableView, willSelectRowAt indexPath: IndexPath) -> IndexPath?, check the for_sale property. If it’s true, save the selectedIndexPath for a segue. If not, display an error message and return nil to prevent segueing. The source code of PhotoListViewController could be found here, please refer to the tag “MVC”. So what’s wrong with the code above? In the PhotoListViewController, we can find the presentational logic such as converting Date to String and when to start/stop the activity indicator. We also have the View code such as the implementation of showing/hiding the table view. In addition, there’s another dependency, the API service, in the view controller. If you plan to write tests for the PhotoListViewController, you will find that you’re stuck since it’s too complicated. We have to mock the APIService, mock the table view and mock the cell to test the whole PhotoListViewController. Phew! Remember that we want to make writing tests easier? Let’s try MVVM approach! Design a set of interfaces for binding. Move the presentational logic and controller logic to the ViewModel. Each UI component has a corresponding property in the ViewModel. We can say that what we will see in the View should be the same as what we see in the ViewModel. But how do we do the binding? Use KVO (Key-Value Observing) pattern. Use 3rd party libraries for FRP (Functional Reactive Programming) such as RxSwift and ReactiveCocoa. On the other hand, in the View, we assign a closure to the propChanged as a callback closure for value updates. Every time the property prop is updated, the propChanged is called. So we are able to update the View according to the change of the ViewModel. Quite straightforward, right? Each PhotoListCellViewModel object forms a canonical representation of a cell in the table view. It provides data interfaces for rendering a UITableView cell. We put all PhotoListCellViewModel objects into an array cellViewModels, the number of cells is exactly the number of items in that array. We can say that the array, cellViewModels, represents the table view. Once we update the cellViewModels in ViewModel, the closure reloadTableViewClosure will be called and the View updates correspondingly. As you can see, the properties of the PhotoListCellViewModel provide interface for binding to UI components in the View. The PhotoListViewModel starts to fetch data. 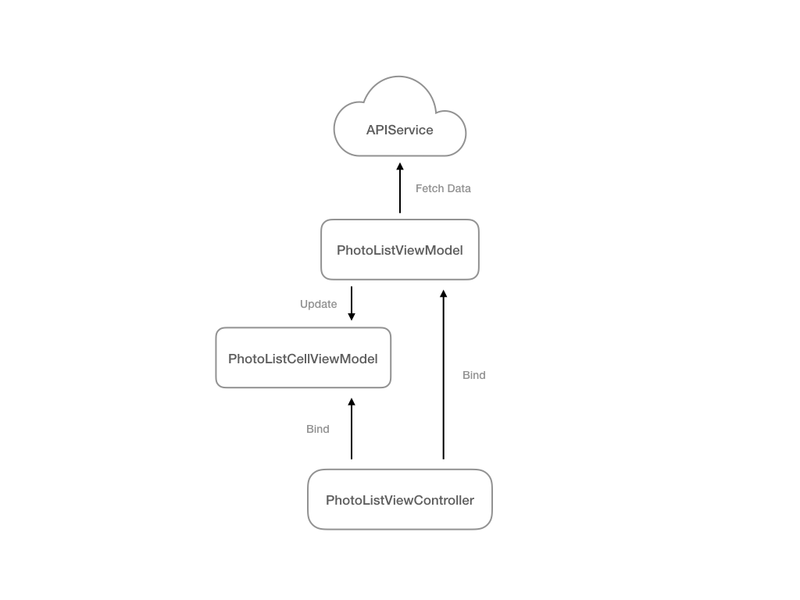 After the data fetched, we create PhotoListCellViewModel objects and update the cellViewModels. The PhotoListViewController is notified of the update and then layouts cells using the updated cellViewModels. It’s a long journey, right? Bear with me, we are touching the core of the MVVM! 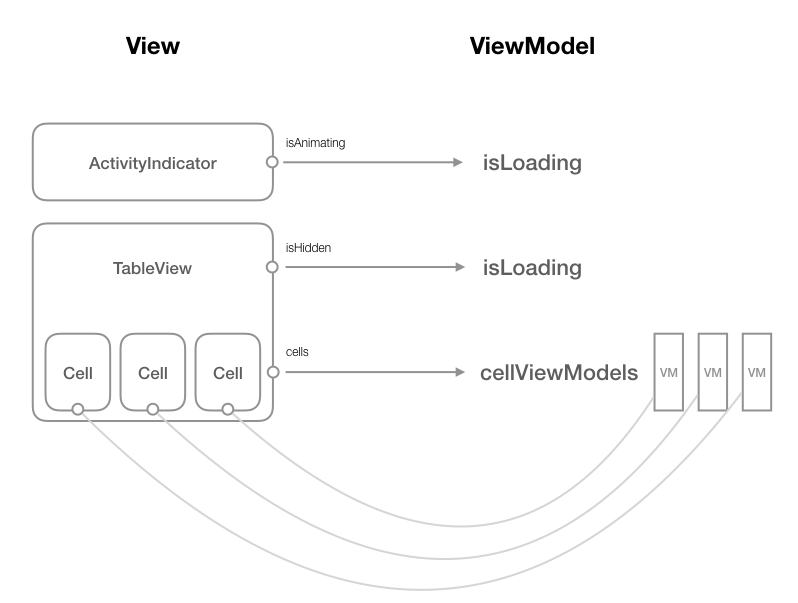 In the PhotoListViewModel, we have an array named cellViewModels, which represents the table view in the View. In the code snippet above, we set the property isLoading to true before starting to fetch the data from the APIService. Thanks to the binding we did before, set the isLoading to true means that the View will switch the active indicator on. In the callback closure of the APIService, we process the fetched photo models and set the isLoading to false. We don’t need to touch the UI component directly, but it’s clear that the UI components work as what we expected when we changed those properties of the ViewModel. It does a simple job, wrapping the photo models into an array of PhotoListCellViewModel. When the property, cellViewModels, is updated the table view in the View reloads correspondingly. Made a binding theme using the closure. Removed all controller logic from the View. My biggest concern about MVVM is the ViewModel does too many things. As I mentioned in this article, we have the controller and the presenter in the ViewModel. Also, two roles, the builder and the router, are not included in the MVVM pattern. We used to put the builder and the router in the ViewController. If you’re interested in a clearer solution, you might want to check the MVVM+FlowController (Improve your iOS Architecture with FlowControllers) and two well-known architecture, VIPER and Clean by Uncle Bob. There’s always a better solution. As professional engineers, we’re always learning how to improve the code quality. Developers like me were used to be overwhelmed by so many architectures and don’t know how to start writing unit tests. So the MVVM is a good place to begin your journey. It’s simple and the testability is still good. In another Soroush Khanlou’s article, 8 Patterns to Help You Destroy Massive View Controller, there are many good patterns and some of them are also adopted by the MVVM. Instead of being hampered by a gigantic architecture, how about we start writing test with small yet powerful MVVM pattern? In the next article, I will continue to talk about writing unit tests for our simple gallery app. Stay tuned! If you have any questions please don’t hesitate to leave a comment. Any kind of discussion is also welcome! Thank you for your attention.